After the Norman invasion of Ireland, these lands were held by the Fitzgerald Family. 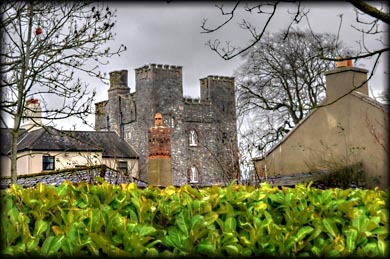 In the 13th century the lands and property were in the hands of a Nicholas Barby, who is believed to have built the the first castle here in c.1298. The existing castle was built by the Sutton family towards the end of the 15th century. It is a four storey tower, almost square, tower house, with projecting towers at the north-west and south-west corners. The NW tower, pictured left, projects to the west of the main structure and the SW tower projects to the south. The pronounced base batter was a later addition. The castle changed hands several times, before the Gaynor family built the Elizabethan house 1558-1603, attached to the west wall. The house was converted to a hotel in 1971. A pointed doorway leading into the tower house, can only be accessed through the hotel. Notable owners include, Bartholomew Van Homrigh, Lord Mayor of Dublin in 1697-1698 and the musician Eric Clapton from 1979-1987. 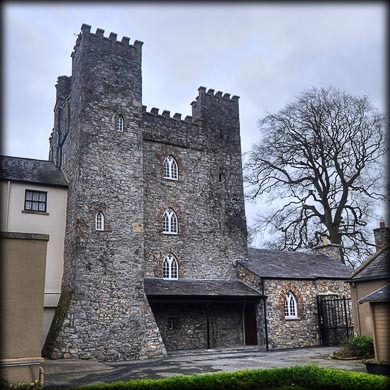 Situated: Barberstown Castle is on the grounds of a modern 4 star hotel complex. From Straffan take the Barberstown Road north for 1.2 kilometres. Discovery Map 50: N 9269 3114. Last visit Jan 2018.